Not Having a Plan – As a Realtor, I offer staging tips to my Seller in a Pre-listing Consultation, but a Professional Staging Plan includes a written evaluation, and estimates within your budget. Please, always have a contract with any sub-contractors for your protection. 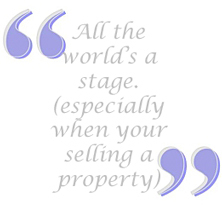 Waiting – Waiting to see if the property sells by itself without doing ANY staging is a mistake. If the Buyer doesn’t notice needed updating, the home inspector or the Appraiser will. That equals higher costs or worse, a lost sale. “DIY “– Trying to “Do it all yourself”. Help is available to lighten the load of cleaning up and cleaning out, painting carpeting, etc. Save your receipts. Ask your Accountant about “cost of sale” deductions, if allowable in your circumstance. As a Real Estate Photographer, I know the importance of good staging and good real estate photography to highlight the focal point of each room. I know what works and what doesn’t. Since I’m a Realtor not a Professional Stager or Decorator, I especially recall one time a Stager recommended painting rooms yellow. My first reaction was, “really, yellow?” ugh! But the Stager was right. Light poured into most of the windows and the pale yellow tones created a warm and inviting feeling that’s not easy to achieve when there’s minimal furnishings. P.S. That listing sold while a couple of other homes on the market at the same time were withdrawn and remain unsold. Set the stage, keep the right stuff and get sold. Contact me, whenever you have any real estate questions. I love to talk about how we can make you successful in any real estate market. This entry was posted on Tuesday, August 9th, 2011 at 1:10 pm	and is filed under Chester County, Expired Listings Help, Home Sellers, Real Estate Photography. You can follow any responses to this entry through the RSS 2.0 feed. You can leave a response, or trackback from your own site.